This Friday, Japan’s Henn na Hotel (“henn na” means “weird” or “strange” in Japanese) opens its doors to fleshy, organic customers, welcoming them with chatty machines. 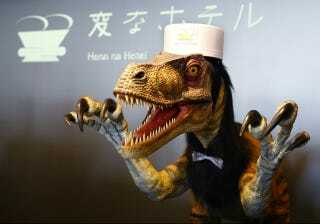 While it’s a functioning hotel, don’t go thinking that Japan is brimming with wacky guesthouses run by extinct reptiles in animatronic form. Henn na Hotel is actually part of a theme park located in Sasebo, a city in southern Japan’s Nagasaki prefecture. But the robotic staff is actually one sillier offshoot of a new movement that the country’s taking seriously. Japan, which has one of the biggest robotics industries in the world, is looking to rapidly fill customer service positions with helpful talking gadgets instead. The country’s population is quickly aging, which means the workforce will be quickly shrinking. Plus, swapping people for machines cuts labor expenses. Just last week, Haneda Airport near Tokyo announced it will become a testing ground this fall for a fleet of robots and an arsenal of powered exoskeletons to assist human staff and customers. Of course, the Henn na Hotel is on the zany fringe of this trend; it’s all about entertainment, not practicality. Still, I am 100% onboard with this, especially since the price sounds right: rates begin at 9,000 yen (around 80 USD) a night. Can the robots make ice machine runs for me, too? The dino concierge greets guests in a human male voice speaking American accented English. “If you’d like to check in, please press 1.” Visitors then input commands using a touch screen. At the front desk, an android receptionist is flanked by her colleagues, a mini scifi humanoid and a scary-looking dino. The pixie-voiced female android interacts with guests in Japanese as she checks them in and out. A smaller, more cartoony ‘bot rounds out the colorful staff at the front desk. Upon check-in, the robots use facial recognition technology. Instead of keys, guests enter their rooms with a quick digital face scan. Porter bots like these packmule customer luggage for them, which cuts labor costs. Similar machines are planned to be deployed at Haneda Airport in Tokyo in September. A “cloak robot” is used to pick up and store suitcases or other guest belongings in lockers. It looks like an industrial robot you’d see in a factory. It also looks like the egg-turning robot arm from the Jurassic Park lab. Life finds a way. Management welcomes reporters with waves and Segway-looking vehicles. A robot stands by Henn na Hotel’s opening ceremony on Wednesday. Robots are even found in guests’ rooms, like this one with a pink flower-shapped noggin, Tuly, who acts as a bedside concierge. Tuly organizes wakeup calls and provides weather forecasts. President Hideo Sawada poses in one of the hotel’s rooms. It opens Friday.